The best new speakers from the Bristol Show 2017 | What Hi-Fi? We start with a new version of a classic. The Acoustic Energy AE1 Active is, you guessed it, an active version of the iconic AE1 standmounter and marks 30 years in the hi-fi business for the company. Next up are the KEF LS50 Wirelesses. Based on the Award-winning LS50 standmounter, the new model adds streaming capability, built-in amplification and four 24-bit/192kHz DACs. Kudos has a new addition to its Titan range of loudspeakers in the shape of the Titan 707s, while the Loewe Klang 5 floorstanding speakers were looking good next to the company's 4K OLED TV, the Bild 7. Q Acoustics gave its new high-end Concept 500s their first UK airing at the show, as did ELAC with its Uni-Fi FS U5 floorstanders. Spendor had three new additions to its A-Line of speakers with the A1, A2 and A4 all in attendance. 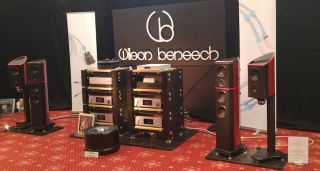 And we round things off with the attractive and carbon-clad A.C.T One Evolution P1s from Wilson Benesch.